The Rhine Falls are the largest waterfalls in Europe and lie on the border of the canton of Schaffhausen, the canton of Zurich and Germany. 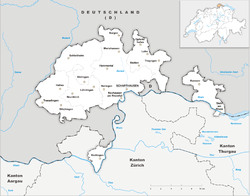 Wikimedia Commons has media related to Schaffhausen (canton). This page was last changed on 20 July 2018, at 19:19.